Porcelain veneers are thin pieces of porcelain bonded to your existing tooth to enhance your smile. Today’s porcelain veneers, like those used by Drs. Drake and Wallace, are strong and beautiful. There are several issues that can be addressed with porcelain veneers. If you have stained teeth that cannot be whitened with traditional whitening treatments (such as tetracycline-stained teeth), they can be a great option. 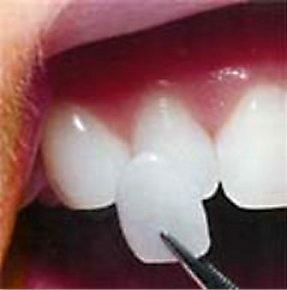 Veneers can also be used when you have a gap in your teeth that bonding will not adequately fix. Or, maybe you have some chips in your teeth or would like to lengthen them. They can also make it possible to “straighten” your teeth without braces—no painful adjustments or seemingly endless visits required. The nice thing about correcting these defects with porcelain veneers is that you can get the shape, color, and sparkle that you want in your teeth. We have full latitude to give you any smile design that you want. After we discuss your options and you decide that porcelain veneers are the best option for your situation, we will prepare your teeth by shaving a thin layer of tooth surface to make room for the veneer to bond to the tooth. Once your teeth are prepped, we will take an impression that will be sent to a ceramist and used to make your veneers. We will likely place a set of temporary veneers for you to wear until the final porcelain ones are bonded to your teeth. Keeping your teeth and gums healthy during this wait is crucial since bleeding gums can compromise the bond. Porcelain veneers can be used to treat a wide range of dental anomalies. They require only minor preparation and can usually be completed in two visits over a couple of weeks. Porcelain is a very hard material, harder than tooth enamel, and it resists stains better than tooth enamel. With proper care, they can last for many years. If you would like to explore how to improve the look of your smile, you may visit our request an appointment page or call us to schedule.